Steve Everett, director of the Center for Faculty Development and Excellence, will teach Introduction to Digital Sound Design, one of the initial online course offerings. Emory University faculty are gearing up to offer the University's first MOOCs — massive open online courses — in areas that represent some of the university's distinctive strengths in liberal arts, the health sciences and policy studies. The online course provider Coursera today announced that Emory and 16 other institutions — ranging from private schools such as Brown and Vanderbilt, to public universities like Ohio State and the University of Maryland, to international institutions such as the Hebrew University of Jerusalem and the University of London — have signed agreements with Coursera to bring their courses online for free to expand education opportunities on university campuses and worldwide. With today's announcement, Coursera now hosts more than 200 courses from 33 domestic and international universities and reaches over 1.3 million students across the globe. 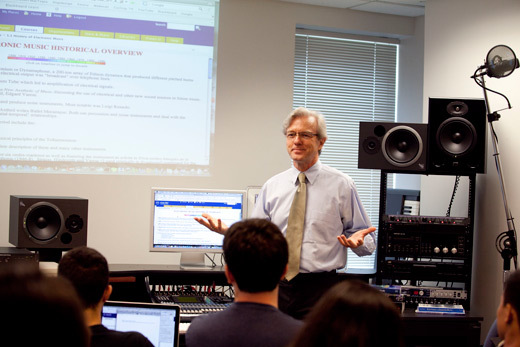 • Introduction to Digital Sound Design, taught by Steve Everett, professor of music, Emory College of Arts and Sciences, and director, Center for Faculty Development and Excellence, provost's office. Everett directs the Music-Audio Research Center and has been a guest composer at several well-known conservatories in the U.S. and Europe. His compositions have been performed in twenty countries. • Immigration and U.S. Citizenship, taught by Polly Price, professor of law, School of Law. A former clerk for Judge Richard S. Arnold of the 8th U.S. Circuit Court of Appeals, Price teaches citizenship and immigration law, torts, legislation and regulation, American legal history, and Latin American legal systems. She is the author of two books and numerous articles. • AIDS, taught by Kimberly Hagen, assistant director of the Center for AIDS Research at Emory University. An assistant professor in the Department of Behavioral Science and Health Education, Hagen has been awarded two of Emory's highest honors, the Emory Award of Distinction and Teacher of the Year. Since its first course offerings six months ago, Coursera has accelerated toward its mission to educate millions worldwide, building meaningful community engagement systems, and establishing advanced technologies to support learning online. The 17 universities joining Coursera's platform today will expand the growing course roster, adding new and increasingly broad perspectives in the areas of music, medicine, humanities and more. "This is a remarkable opportunity to extend our impact by offering learners everywhere in the world the chance to experience a rich and diverse sampler of Emory faculty and course topics," said Earl Lewis, Emory's provost and executive vice president for academic affairs. "At the same time, we also anticipate learning lessons of our own from this experience, as we consider future ways in which digital communications might build on and enhance our existing campus-based programs." Lewis noted that Emory's initial course offerings are being developed with the help of the Center for Faculty Development and Excellence and the Emory Center for Interactive Teaching, based in the Library and supported by the Office of Information Technology. No courses offered by Coursera count for academic credit at this juncture. "Part of the attraction of this program is the ability to experiment with new forms of pedagogy, as we build our own skills in online instruction and learn more about the blends of digital and in-person engagement that will characterize successful institutions of higher education in the coming decades," said President Jim Wagner. Everett, who is offering the beginning course in a highly sought-after sequence he teaches in computer music, said Coursera represents a new approach to the centuries-old mission of universities, which is to discover, teach, and apply knowledge. "While these new venues do not yet have a resource generating mechanism," he said, "we in higher education do have an opportunity to help people in societies around the world – particularly in areas that have no access to universities of their own – to better their lives, while at the same time exploring ways to enhance the value of our core programs." On an individual level, he said, Coursera is an effective way for faculty to pursue their own research and extend their teaching engagement with learners on an international scale. The CFDE has been working with faculty to help them broaden their societal impact in the pursuit of public scholarship, and Coursera represents the next logical step for some in that progression. "We set out to make education accessible to everyone around the world, and seeing our vision come to life has been an incredible experience," said Daphne Koller, co-founder of Coursera. "With the addition of the exceptional, forward thinking institutions coming on board today, we're proud to offer an even more diverse experience to our students." "Over the coming months, we will continue to focus on bringing the best educational content and support systems to people around the world so that they can continue to enrich their lives through learning," said Andrew Ng, co-founder of Coursera. New courses will join current university offerings on Coursera over the coming months. For a full list of course offerings across disciplines and universities or to enroll in an upcoming course, visit Coursera.org.